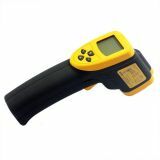 Infrared Thermometer -50 ° C to +650 ° C, 4-digit LCD display Infrared thermometer with temperature range -50 ° C to +650 ° C.
List Price 82.00лв. VAT Incl. 77.90лв. VAT Incl. 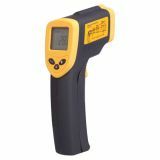 Infrared thermometer, MS6530Т, -from 20 °C to +350 °C, D:S 12:1 Infrared thermometer MS6530T gun type with a measuring distance of 12: 1, temperature range from -20 ° C to +350 ° C for non-contact temperature measurement of an object. Pyrometers are devices, used for measuring the temperature, which have a wide temperature range, small size and ease of use. The device works under laser sight, it has illuminated LED display and an optional emission coefficient. It allows the measurement of the temperature of the heaters, refrigerators, freezers, air conditioning systems or when it is necessary to measure the temperature of inaccessible places, in crevices or a greater distance.